Why should I choose Quality Air? We are committed to providing the best quality installation and service. Our team has over 50 years combined experience in installation, design, and consultation. This exceptional experience allows us to provide professional advice for the air conditioning layout of your home or business. We listen to what you want and need and offer a suitable solution that meets your requirements. Only using qualified and experienced tradesmen ensures you that your installation will be trouble-free. Remember- we guarantee that if you are not 110% delighted with your finished job, don’t pay us until you are! We design, supply, install, and service ducted air conditioning for commercial and residential customers. Servicing Brisbane and the surrounding suburbs, we have established great relationships with our residential clients and building contractors who we work with on a frequent basis. Yes! We work with many builders on many projects. We are regarded as highly professional in our trade because we are fully qualified. Our team is committed to taking correct workplace health and safety precautions and measures. We work and negotiate with the builder and can rough-in wires, cables, duct and indoor unit at an agreed time to avoid as little disruption to the building project as possible. Ducted air conditioning is an electric generated system which is designed to cool multiple rooms or large, open spaces from a single unit. The system comprises an indoor section called a fan coil and an outdoor unit called a condenser. 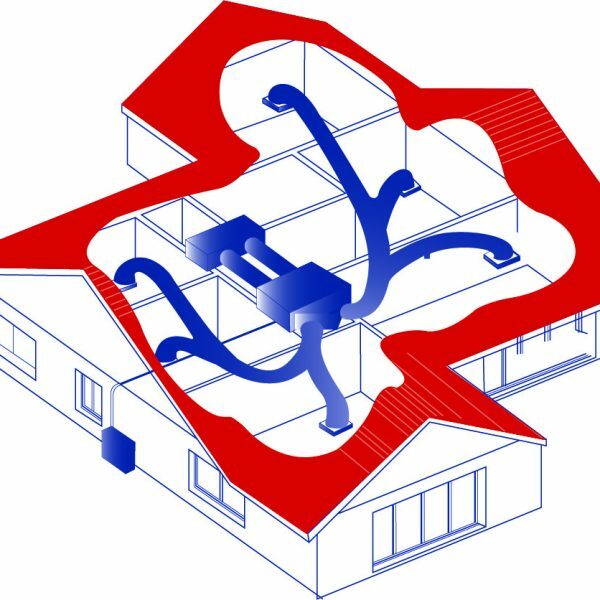 Refrigerated air is delivered to each room via a network of ducting which is installed in the roof cavity. A return air grille is also installed, usually in the hallway, where air is drawn back into the fan coil to be refrigerated and re-dispersed. A filter is attached to the grille to extract dust and lint from the air returning to the fan coil. This is one of the most efficient ways to heat and most importantly in our climate, cool your home. At the touch of a button, you can have different rooms heated or cooled accordingly and with new technology, you can even have different rooms set to different temperatures, whilst maintaining the maximum in energy efficiency. How much noise the system generates and whether you need an inverter. By answering these questions, you can determine what kind of price range you are looking at with your installer. On average, Quality Air offer small systems between $8,000 and $10,000, medium sized units at $10,000 to $13,000 and upwards of this price for larger systems. A split-system air conditioner is a small, singular system which is made up of two units- an outside unit, which is a compressor and an inside air outlet unit or the “wall hung head unit”. The two units are connected by pipes that carry refrigerant. A split system can also be used for heating as well as cooling. They have a small capacity and are designed to only serve a single room or a small open space. An alternative to the standard unit is the multi-split system, which has multiple indoor units connected to a single outdoor unit. A back to back install refers to a split system where the indoor unit is placed in the same position on the wall as the outdoor unit. These installations usually only require a 2.5 metre pipe run. For your reference- back to back are more cost effective. The longer the pipe run, the more expensive it will be. How does ducted or split system air conditioning benefit me? Having ducted or split-system air conditioning will immediately improve your lifestyle and comfort levels within your home or business. Ducted air conditioning in particular will add value to your home or business and is a major future investment. If you consider selling your property air conditioning is an asset to increase the value of your residence. We are not fixed dealers in any particular brand, except those that are proven and quality guaranteed. This allows us to offer exactly the best and most suitable in the market for your requirements. However, the brands we mostly recommend and use are Fujitsu, LG, Daikin, Mitsubishi, Panasonic, Advantage Air and Actron Air. Will installing ducted air conditioning improve my home or business air health? Yes it will. Ducted air conditioning has a removable air filter (hinged) behind the return air grill. The filter collects and stops dust and lint travelling through your home or business. This gives you a cleaner and healthier environment to live or work in. What is the difference between air conditioning and refrigeration? Refrigeration removes heat from enclosed spaces where air conditioning cools and circulates the air in the enclosed space. Refrigeration does not have any control over humidity whereas air conditioning caters for both humidity and temperature control. Air conditioners have filters to improve air quality, refrigeration does not. Refrigeration does not involve circulation of air as it only works on heat absorption for phase change of refrigerant in vapour cycle whereas air conditioning cools the air in air handling unit (AHU) and then circulates it through the space. Will using the air conditioners timer improve energy efficiency? Yes it will. Setting the timer will minimise the hours your air conditioner is in use. You can also set the timer to turn your air conditioning on early in the morning (e.g. 5am) during the summer months to counteract the heat before the sun comes up so your air conditioner doesn’t have to work as hard. This will improve energy efficiency immensely and save money. What other types of air conditioning are there? This type is usually fitted in a specially cut opening through a wall or window. All cooling, heating and circulation components are housed in one box. They are generally noisy and can be an eyesore. These units are mounted on wheels and can be moved from room to room. They extract heat and moisture from the air. They are available in both one-piece and split system configurations. They can be bulky, require emptying of the condensate water and can struggle to cool down whole rooms. The compressor/condenser which is located outside your home. This ensures quiet operation. The evaporator which is positioned within the room that you are cooling or heating. It uses a free-flow fan to circulate conditioned air. The two sections may be installed some distance apart but must be connected by wiring and refrigerant piping. Split systems are available in a wide range of capacities to suit most rooms. Reverse-cycle ultimately means that the refrigeration cycle can be reversed in your air conditioner. Therefore you have total climate comfort with the convenience of cool or warm air, perfect for keeping you comfortable through both summer and winter. Will air conditioning affect my allergies? Taking into consideration that a ducted air conditioning system should be serviced by a professional at least once a year, air conditioning will improve the air quality of your home or business. It not only cools and heats the air but passes it through filters before you breathe it in reducing allergens and bacteria in the air. Do power surges affect ducted air conditioning? In the unfortunate event of a power surge, electrical damage can occur. This can be caused by devices and appliances within the home being turned on and off. Power surges can affect ducted air conditioning just like any electrical appliances. You can protect your home by installing surge arrestors and by limiting the appliances turned on at once. Also during lightning storms it is recommended to turn off your air conditioning just in case of a lightning strike that can fry your electrical appliances. Your air conditioning unit is only at risk if your unit is operating. What is ‘single’ and ‘three’ phase power? Single or three phase power refers to the power supply coming into your property by way of underground or overhead power from the street. Most houses would generally have single-phase power. Three-phase power is typically used in commercial/industrial situations and large homes with multiple large electric appliances drawing larger currents. If your property is drawing a lot of power three-phase power would be installed to avoid power fluctuation. How can I tell what phase power I have? Simply locate the switchboard (normally located close to the front of the house). In the switchboard there will be multiple circuit breakers. The circuit break named ‘Main Switch’ is how you will identify what phase power is available. If there is a single circuit breaker (as per image) this is single (1) phase power. 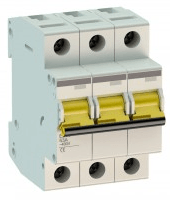 If there are three circuit breakers joined together by one switch (as per image) this is three (3) phase power. For less inconvenience to you, most installations are completed in just one day (excluding electricity supply work if required). Can I get ducted air conditioning installed during construction of my home? Yes. In fact it is more convenient to have installed during construction. The air conditioning is installed in two stages, rough-in and fit-off. Rough in- this is carried out once external walls, internal framing and roof is installed. At this stage the indoor unit, all ducting, zoning, refrigeration and electrical interconnect are installed. Fit off- this is complete when the house is fully built. At this stage all outlets, controllers and outdoor unit is installed and the system is commissioned. Can I install ducted air cooling only? No. Cooling-only ducted air conditioning systems are no longer manufactured. All systems are now reverse cycle meaning you can cool and heat your house from the same system. What air conditioning vents do I get to choose from for my ducted air conditioning? There are 6 vents to choose from when getting ducted air conditioning installed. The round ceiling vent is most common as it blends with the décor of most homes. Can I choose where the vents are positioned? It depends on the internal building structure of your house. We will do our best to accommodate your preferences but ultimately we can only place the outlets in certain areas where other electrical wiring and joiners etc. won’t be interfered with. We recommend the outlet being diagonal to the door to get optimal cooling in each zone. Does installing ducted air conditioning make much mess? Minimal mess is created during installation however, our installers will always leave your home or office clean and tidy, the way it was before we arrived, only more comfortable. How often should my ducted air conditioning system be serviced? To keep your ducted air conditioning system running at optimum operation and energy efficiency it should be serviced every 12 months by a qualified technician. We have our own in house service technicians making it easier to work around your busy lifestyle. Why should I get my air conditioner serviced? Maintaining your air conditioner will ensure better air quality and a better functioning and efficient system. When you get a professional ducted air conditioning service a full system check is completed including checking components and equipment, all electrical wire connections, gas charge, oil levels, duct connections and drains are working to ensure your system is working at its optimal capacity. What can happen if I don’t service my ducted air conditioner regularly? Condensate drain will block up and eventually overflow causing serious water damage to the ceiling. The fan blades and coil in the indoor unit can corrode or rust due to dust particles from a dirty or old filter. Blocked filters can cause negative pressure on the condensate drain that will lead to dispersion of water through the main AC ducting and possibly outlets. Unknown to you, damage can occur to the air distribution ducts resulting in a loss of cooling / heating and decreased efficiency. In Brisbane’s humid climate mould and bacteria can build up on the fan blades of the indoor unit. The dehumidifying process of the air conditioner often causes some condensation, but pooling or leaking water is different. There are a few things that can cause such a leak and most of them need to be addressed in order for your unit to run more efficiently. If you need help identifying these problems with you ducted air conditioner call us on 33957633. 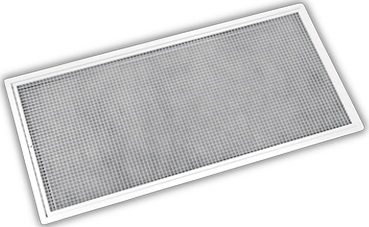 A filter (return air grill) is usually located in a central area of the house or building to filter as much air as possible. The bigger the house or building, the more filters will be required. In a normal residential house the filter should be checked/cleaned every three months. Dust collects on the filter and restricts the airflow. The restricted airflow reduces the efficiency of the system and if it becomes blocked it can cause damage to the fan coil unit. How do I clean my ducted air conditioning filter? Undo the hinged Return Air Grill frame fixing. The fixing is usually a thumb screw or a sliding clip. Swing the frame open and let it hang vertically. Vacuum the lint off the filter. Wash the filter in warm water. Let the filter completely dry out in the sun. Slide the filter back into the hinged grill, swing the grill back into the recess and screw up the fixing screw or slide back the clip. I have cleaned my filter but why is the light still flashing? Once you’ve cleaned your air filter, your air conditioner needs to be reset. Press the Reset button to turn off the filter light. For ducted the reset button is located on your controller. On wall mounted split systems and floor consoles, remove the grille to find the reset button. Do you have payment plans and terms? Yes! We offer payment terms under conditions and credit checks. We also offer Once Credit who offer -borrow up to $20,000, no deposit, interest free terms available and Certegy Ezi-Pay which offer you a $5,000.00 limit, no interest, payable over different terms. We also take cheque, credit card, master card and direct debit. Talk to us today, about our interest free terms! Call us on 07 3395 7633. *Available to approved applicants only on a Once Line of Credit. Terms, conditions, fees and charges apply. Interest is payable on any balance outstanding after the interest free period. Finance provided by Once Credit Pty Ltd ABN 99 112 319 632, Australian Credit Licence Number 386194. Payment Option Two: Certezy Ezi-Pay – Pay no interest ever! Get up to $5,000 credit limit, payable on different terms. Very simple and easy to use. Please call us on 07 3395 7633 to find out more. The cost of ducted air conditioning is very much dependent upon the size of area to be air conditioned. Usually small systems start at $7,500-$10,000, middle size systems at $10,000-$12,000 and larger systems from $12,000 and upwards. It is important to understand that these several factors below that will affect power consumption and vary the cost. Insulation: This will reduce the overall running cost by keeping out the heat. Total area: The larger the area or the more zones on, the longer the unit will run. Weather: The hotter or cooler the day, the longer the compressor will run. Time: How often and how long you run the unit. Preferred temperature: the temperature you prefer will influence costs as the unit will have to work harder or easier to cater to your needs. 36c-$1.36 per hour depending on unit size (based on 70% cycling of compressor). When you have an air conditioning system installed by Quality Air we offer you a 10 year warranty program for our installation and workmanship of the installation from the date of commissioning of your air conditioning project. What is your manufacturer’s warranty? When using Quality Air as your ducted air conditioning specialist, we give you the confidence that we are providing you with the best possible ducted air conditioning solution for you. We offer 5 years manufacturing warranty of the equipment. How much does the 10 year workmanship warranty cost? We only offer this warranty as we trust the quality of equipment we sell and can pass on this assurance to our customers. Our 10 year warranty program is valued at $799.00 and can only be valid if the unit is serviced as per our recommendations.